Hello, it is Jana here again. I hope you are having great summer and enjoying the nice weather. came to visit us, so I put together all the pictures we took and made this little mini album. from the beautiful papers. I love how it looks full and bulky. Since the string would clash with the title, I used a little piece of Velcro for the album to stay closed. personalized words and a few enamel dots. the system. A tiny book with baby pictures. composed then please watch the video at the end of this post. 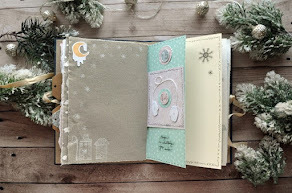 A few details of the mini book. As embellishments I often use transparent stickers. And here comes the harmonica. be glued together I trimmed the blue one a bit and made a little pocket for even more pictures. Here is the other side of the harmonica. saw it in Paige Evans’ post and I had to try it as well. Since I made the pocket a bit wider (by folding the sides) the album slides in it very easily. All the lovely tags and memories. (and excuse) to make something small and adorable!